There's a really good reason the stock market has surged nearly 10% in the past month: the U.S. economy is looking a little like the Energizer Bunny. That's especially true when compared to many parts of the world (especially China). American companies are hiring, gas is cheap, car sales are booming and even the government deficit is shrinking. In February, America added 242,000 jobs. That blew out expectations of a mere 190,000 jobs and put many at ease about the economy's health. "The probability of a recession in my mind this year is close to 0," says Bob Doll, chief equity strategist at Nuveen Asset Management. Yet few outside the White House are willing to call this a victory. Most experts say it's a solid B or B+ economy: Good but not great. America's economy has three big bruises right now that are getting lots of attention on the 2016 campaign trail: wages are stagnating, growth is lackluster and the manufacturing sector is weak. "It's a late afternoon economy," says Stuart Hoffman, chief economist at PNC. The U.S. economy is jogging along at about 2% growth. That's decent, but far slower than the over 3% average America experienced from the 1960s to 2006. On top of that, the typical middle class family is taking home about the same amount of income as they did 20 years ago (once you adjust for inflation). News that big retailers like Walmart (WMT) and Costco (COST) were hiking their wages for entry-level workers sparked hope that Americans across the class spectrum would finally get a true income boost. But wage growth disappointed in February. With unemployment so low, the best economic models say wages should be going up a lot by now, but the bounce has been more like a head bob than an actual jump. "This was a step backwards," wrote Michael O'Rourke of Jones Trading in a note. "The weakness in Average Hourly Earnings raises questions about the quality of the jobs being created, which has been a recurring theme throughout the recovery and the expansion." 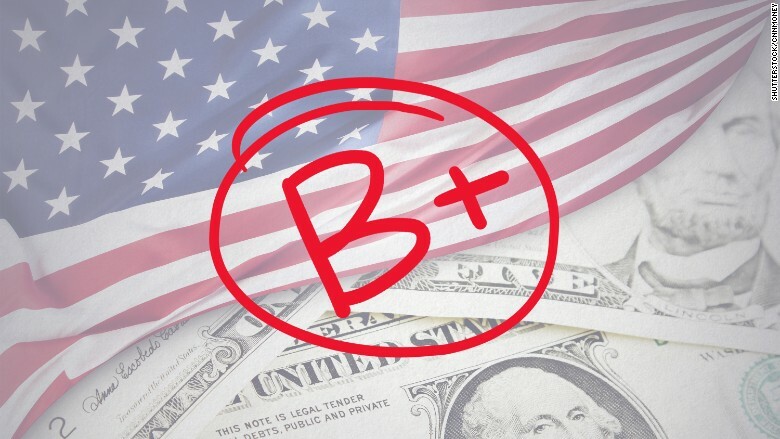 Optimists argue that the U.S. can probably muddle along in B+ mode for a long time. Economic expansions typically last 56 months before a recession hits. The U.S. is already on month 80 of the current cycle, and few are talking about a recession any time soon. But what's scary is whether the U.S. can ever break out of this slow burn. Can it get back to the A grade? Or even just avoid falling into C grade when the next global shock comes along? The next president is sure to face an America with an aging population. To put that another way, the U.S. workforce -- and tax base -- is shrinking. That makes it more difficult to grow. Some question whether America will ever be able to get back to 3% average annual growth. There are two parts to the growth formula: you need more people working (which looks unlikely unless there is a major immigration wave) or you need current workers to be more productive. Jeb Bush was slammed for his suggestion over the summer that Americans need to work longer hours. It wasn't a great campaign line, but theoretically, he's right. Increasing productivity takes more hours or else better and better technology. But as the New York Times wrote this weekend, so far, Silicon Valley hasn't "saved us" from a productivity slump. Technology isn't helping enough to counterbalance all the other forces at work holding the economy back. Democrat Bernie Sanders, and to a certain extent Hillary Clinton, argue for more government spending to pump up growth. Renowned economists like Larry Summers have been saying this for a while. Republicans like Donald Trump, Ted Cruz and Marco Rubio say the cure is trimming government. The U.S. needs to stop overspending and running up debt and it needs to cut regulations that hold back business. The American people will vote for their preferred medication. But it will be a long shot to expect either policy to hypercharge the economy back to the days of old. Recession fears are fading, but no one's talking about a boom. "There's a big difference between a recession and slow growth," says Nuveen Asset Management strategist Doll. "Just like there's a big difference between slow growth and big growth."